Delightful little Roxy is suddenly blind with other neurological deficits. Nothing on MRI (well a brain for sure but no lesions – you know what I mean!) but a severe inflammatory picture on the CSF tap. What is causing her blindness? She has optic neuritis as part of Granulomatous Meningioencephalitis – notice the fluffy surface to the disc and raised blood vessels. 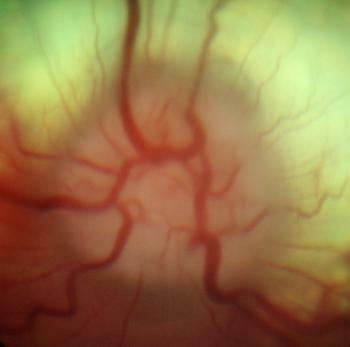 Here is her optic nerve after a week of cyclophosphamide, vincristine and prednisolone. A somewhat improved disc surface but she is still blind. There is little in the literature about the prognosis for recovery of sight, though we hope that further treatment may improve her condition to allow some return of vision. 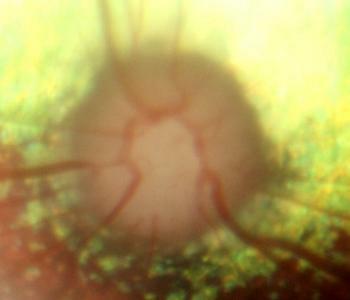 This entry was posted in Cases and tagged dog, optic neuritis. Bookmark the permalink.